It has always seemed a bit odd to me that the church has become so divided and contentious over something that the scripture speaks so clearly about. It could be that people think speaking in tongues sounds weird, or they were taught by somebody that it was of the devil, or they were so perplexed by it that they just assumed it was nonsense. Either way, I will begin this blog by stating that speaking in tongues is certainly Biblical. Why? Because it's in the Bible and was clearly practiced by the early church including the Apostle Paul. Many questions surrounding the topic of speaking in tongues are often discussed: Is it still for today? What about pagan cultures that "speak in tongues" during their demonic rituals? What types of tongues are there? What does speaking in tongues do? When is it appropriate to speak in tongues? How is speaking in tongues related to the Baptism in the Holy Spirit? Can everyone speak in tongues? And so on and so forth. I intend on answering many of these questions in this article, and hopefully it will be a blessing for all who are searching for Biblical answers about this commonly discussed topic. "8 Love never fails. But where there are prophecies, they will cease; where there are tongues, they will be stilled; where there is knowledge, it will pass away.9 For we know in part and we prophesy in part, 10 but when completeness comes, what is in part disappears. 11 When I was a child, I talked like a child, I thought like a child, I reasoned like a child. When I became a man, I put the ways of childhood behind me. 12 For now we see only a reflection as in a mirror;then we shall see face to face. Now I know in part; then I shall know fully, even as I am fully known." Notice in verse 8 it says "where there are tongues, they will be stilled" and in verse 10 it says "but when completeness comes, what is in part disappears." Some people including a popular Bible commentator named John MacArthur believe that this passage is saying that tongues will be stilled (cease) when the canon of scripture is complete. That is, they believe Paul was referring to a future time when all of his letters and other New Testament scriptures would be combined together to form the Bible (the canon of scripture), and that when the Bible was completed tongues would no longer be necessary because we have all that we need in the Word of God. The problem with this is that in context this passage is not referring to the completion of the Bible. I would even argue that there is not even the slightest indication that Paul is referring to the canonization of scripture here. The overwhelming contextual evidence of this passage points to Paul referring to the resurrection, not the completion of the Bible. So when he says, "but when completeness comes, what is in part disappears," he is referring to Christians receiving their glorified bodies in which they will be equipped to fully understand God's love and see clearly those things which our current faculties do not have the capacity for. Even though we now have the canonization of scripture there are still many things that we only know "in part." If Paul was referring to the canonization of scripture he would not have used the phrase "we" (verse 9) including himself and the Corinthians who were all dead by the time that scripture was canonized. Paul was speaking of something that both he and all of the Corinthian believers would experience together, namely, the resurrection. The at the resurrection we will be equipped with what we need to fully know certain things that were only able to be partly known during our life on Earth. Now some people often allude to the fact that many pagan cultures use a sort of "gibberish" in their demonic ceremonies and rituals. They have asserted that because this "gibberish" sounds like what many Christians sound like when they speak in tongues then it must be that Christians are practicing a pagan exercise when they do so. This is unwarranted however because the Bible teaches that speaking in tongues is a spiritual gift from God to a believer, not a gift from the devil to an unbeliever. It could be argued much more effectively that Satan, who envies God, attempts to manifest a counterfeit version of tongues among these Pagan rituals. Or it could also be that these rituals are merely using inane gibberish and not a "counterfeit tongues" at all! Therefore, it's really nothing but baseless speculation going with this argument, not a valid Biblical objection. 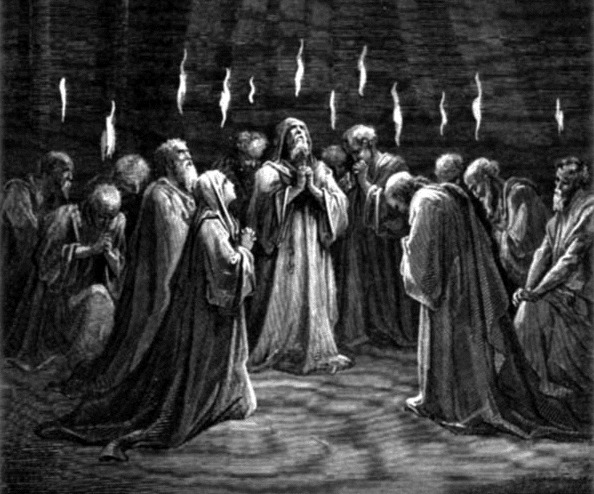 v. 1-8-"When the day of Pentecost came, they were all together in one place.2 Suddenly a sound like the blowing of a violent wind came from heaven and filled the whole house where they were sitting. 3 They saw what seemed to be tongues of fire that separated and came to rest on each of them. 4 All of them were filled with the Holy Spirit and began to speak in other tongues as the Spirit enabled them. 5 Now there were staying in Jerusalem God-fearing Jews from every nation under heaven. 6 When they heard this sound, a crowd came together in bewilderment, because each one heard their own language being spoken.7 Utterly amazed, they asked: “Aren’t all these who are speaking Galileans?8 Then how is it that each of us hears them in our native language? v. 2 "For one who speaks in a tongue does not speak to men but to God; for no one understands, but in his spirit he speaks mysteries." In this chapter Paul is explaining the operation of tongues as a prayer language. He show us that when one prays in tongues it is ultimately the Holy Spirit praying through us. Our "spirit prays" and our spirit is the manifestation of the Holy Spirit in us (see 1 Corinth 6:19). Paul confirms this in 1 Corinthians 14:14 saying, "for if I pray in a tongue, my spirit prays." This powerful gift is very helpful for a person who is called to be a prayer warrior in the church. A person with the gift of tongues can use his/her gift to allow the Holy Spirit to intercede through them according to God's perfect will, sometimes with "groanings"(see Romans 8:26). Our Earthly languages can only partly describe God's will, but when the Holy Spirit prays through us in the language of Heaven (angels) He is able to perfectly describe God's will. Paul encourages the one who prays in tongues to ask for an interpretation because not even they can understand what they are praying, but what they are praying is from God (1 Corinth 13:14). Our next question is: When is it appropriate to speak in tongues? I will begin my answer by addressing the first operation of tongues (speaking in an unknown Earthly language for the purpose of evangelism). In this scenario the Bible gives us one primary example which we discussed out of Acts chapter 2. I do not see any major guidelines being set forth for this specific operation but I do see two primary conditions being met. 1. Being empowered to speak in the unknown tongue. 2. Having people present who speak that language. So basically we should use this operation of the gift whenever God allows us to, trusting Him to sovereignty orchestrate the situation. Now, with addressing the operation of tongues as a "prayer language" I have to say the Bible does set forth some guidelines as to what the appropriate use of this gift should be. The reason the Bible gives us guidelines regarding this operation of the gift is because usually nobody can understand what you are saying when you use it. 1 Corinthians 14:23-25- "23 Therefore if the whole church assembles together and all speak in tongues, and ungifted men or unbelievers enter, will they not say that you are mad? 24 But if all prophesy, and an unbeliever or an ungifted man enters, he is convicted by all, he is called to account by all; 25 the secrets of his heart are disclosed; and so he will fall on his face and worship God, declaring that God is certainly among you." So here Paul explains that when the church assembles it would be better for the person who is addressing the crowd to speak a word of prophecy rather than tongues because if an unbeliever or ungifted person is among the crowd they will not be able to understand you if you do. Paul explained why tongues normally isn't understood by others earlier in the chapter saying, "2 For one who speaks in a tongue does not speak to men but to God; for no one understands, but in his spirit he speaks mysteries. 3 But one who prophesies speaks to men for edification and exhortation and consolation." So Paul basically advocates for the use of tongues to be generally done in private because He would rather the church be strengthened by words that people can understand. However, Paul does give permission for tongues to be used while addressing the assembly if someone who is gifted to interpret is present: v. 27- "If anyone speaks in a tongue, it should be by two or at the most three, and each in turn, and one must interpret; 28 but if there is no interpreter, he must keep silent in the church; and let him speak to himself and to God." So what does all this mean practically? If you have the gift of tongues it would be put to good use by using it primarily in a private setting. Does this mean it cannot be used at church? No because Paul says, "do not forbid to speak in tongues (1 Corinth 14:39)." But it does mean one should use it wisely. If you are addressing the church corporately do not speak in tongues unless you have an interpreter. If you are using it during worship be aware of who is around you and use discretion as to whether or not you could be a distraction to their worship. If you are in a setting in which it would be inappropriate to pray in tongues audibly, do so inwardly. And finally I think it is healthy for the church to have times set aside for prayer in which people are welcome to freely pray in tongues and commune with God, this would usually happen at a private prayer meeting which is specifically structured for freedom in the Spirit (See Acts 2:4). We also must be sensitive to the fact that in the Bible people who were filled with the Spirit for the first time would often speak in tongues, so we need to be open to this possibility when doing missions, etc. (Acts 2:4, 10:44-46, 15:7-9, 19:1-7). All in all whatever gift we use, we need to use it for the purpose of love. If my praying in tongues does nothing for the edification of another I will wait until a more appropriate situation to use it. The next common question related to speaking in tongues is: How is speaking in tongues related to the Baptism in the Holy Spirit? First of all, we need to define what the Baptism in the Holy Spirit is. The Baptism in the Holy Spirit means literally "to be fully immersed (baptized) in the Holy Spirit." Jesus described it to His disciples as an empowerment they would receive which would fully equip them to be witnesses on His behalf (Luke 24:49). We see the fruit of this empowerment manifesting in various signs, wonders and supernatural occurrences all throughout the book of Acts. There are two main positions in modern Christianity regarding when the Baptism in the Holy Spirit occurs for the believer. One is that every believer is baptized in the Holy Spirit as soon as they receive Jesus Christ, and the other is that believers receive the Baptism in the Holy Spirit subsequent to receiving Christ conditioned upon their seeking it. Addressing these positions is beyond the scope of this article so I will focus primarily on how the gift of tongues relates to the Baptism in the Holy Spirit. The Pentecostal denomination of Christianity teaches that the Baptism in the Holy Spirit happens subsequent to receiving Christ conditioned upon their seeking it. They also teach that the evidence of this Baptism is that one speaks in tongues. The reason that they come to this conclusion is because in the majority of occurrences in which a person was Baptized in the Holy Spirit in the book of Acts we see the gift of tongues accompanying it (Acts 2:4, 4:31, 8:12-17, 10:44-46, 15:7-9, 19:1-7). The problem with this interpretation is that while the gift of tongues was present in MOST of these instances it was not present in ALL of these instances. We also see other gifts such as prophecy and speaking the Word of God with boldness being present in these different examples. We also see two examples in Acts 4 & 8 where the gift of tongues in not even mentioned. Therefore, we cannot build a concrete doctrine which asserts that tongues is the sole evidence of one being baptized in the Holy Spirit. Biblically speaking, one has been Baptized in the Holy Spirit if they have been empowered by the Holy Spirit to be a witness on behalf of Christ, regardless of whether or not that particular person speaks in tongues. Does this mean that speaking in tongues doesn't accompany the Baptism in the Holy Spirit? Not necessarily, there are SOME examples in scripture where this does happen, but scripture does not specify that it is the sole evidence. In other words, tongues CAN accompany the Baptism in the Holy Spirit but that doesn't mean it absolutely WILL accompany the Baptism in the Holy Spirit. v. 29-30- "29 All are not apostles, are they? All are not prophets, are they? All are not teachers, are they? All are not workers of miracles, are they? 30 All do not have gifts of healings, do they? All do not speak with tongues, do they? All do not interpret, do they? Here Paul explains that every one is given specific gifts, but not everyone has the same gift. So the answer to the question is no, not everyone has the gift of tongues. Paul says that God "distributes spiritual gifts to each person according to His will (1 Corinth 12:11)." God doesn't want everyone to be a teacher, or pastor, or healer, or speaker of tongues. He wants each person to play an individual part. So God gives certain people the gift of tongues so that they can fervently pray God's will at all times and speak His Word to people who have a different language without having to learn it. But God may give other people different gifts according to the calling that He has for them. All of the contention and division that we have allowed to creep into the church because of a misunderstanding of the gift of tongues really needs to be put away. The Bible has clearly explained what the gift of tongues is, it's purpose, and it's power. We need to come together in unity based upon what the Word of God says on the issue and be willing to lay down our preconceived thoughts if they do not agree with scripture. Speaking in tongues clearly has a purpose, but like any gift it can be misused. I believe that the balanced, Biblical approach used in this article should be considered by all when we discuss this issue. If we do this, people will see our love for one another and know that we are true followers of Christ (John 13:35). I hope that you have been blessed! Labels: Baptism of the Holy Spirit, cessationism, continuationism, glossolalia, is speaking in tongues real?, Speaking in tongues, spiritual gifts, tongues, what is speaking in tongues? Recently I have taken some study time to revisit the topic of scriptural interpretation. One of the major interpretation views in modern Christendom is called Calvinism which originated with a man named John Calvin in the 1500s. I am going to walk through what I think regarding each element of Calvinistic doctrine. Calvinism uses an acrostic "T-U-L-I-P" which stands for Total Depravity, Unconditional Election, Limited Atonement, Irresistible Grace, and Perseverance of the Saints. There are some elements of Calvinism that I agree with and other elements that I do not agree with, I will try my best to clearly define what the historic Calvinistic stance is regarding each point and show concisely from scripture why I agree or disagree. I will start by saying that I affirm this definition of total depravity. Where I differ from the Calvinist position is mainly pertaining to the process of man responding to the Gospel. The classic Calvinistic belief is that man is so totally depraved that he cannot even respond to God's gracious offer of redemption without God's enabling him with a special grace beforehand "efficacious grace" (before ever hearing the Gospel). That is, Calvinism teaches that God preselects certain people who will be regenerated to believe beforehand and He does not chose others. I do agree that enabling grace is necessary for an individual to respond but I believe that enabling grace is inherent in the Gospel itself and does not require a pre-regenerative action from God. That is, I believe that when the Gospel is preached everyone who hears receives the necessary grace to either accept or reject the Gospel (this grace comes from the Holy Spirit's drawing through the Gospel itself). This grace is known as "resistible grace." The Bible reveals that man freely chooses to receive Christ in John 1:12 where it says, "But to all who did receive him, who believed in his name, he gave the right to become children of God." The Bible also teaches that God chooses us according to His foreknowledge of us receiving Him in Romans 8:29- "For those God foreknew he also predestined to be conformed to the image of his Son, that he might be the firstborn among many brothers and sisters." So we can choose God and He can choose us without there being any contradiction. So my view on total depravity really differs in the fact that Calvinism assumes that man must be efficaciously drawn in order to believe the Gospel, and the Bible doesn't really support this notion. Titus 2:11 says, "for the grace of God that brings salvation has appeared to all men." I believe God provides resistible grace for all men to accept the Gospel or respond to God's warning to seek Him (God warns us through conscience, creation, and other supernatural means). Nobody will be able to say "but God you left me hopeless and hell-bound unable to repent" on the day of judgement. One thing that we must remember as it pertains to man's ability to respond to the Gospel is that the Bible does present instances in which judicial hardening occurs. Judicial-hardening is God’s active role in blinding an already willfully rebellious person in their rebellion so as to prevent their repentance for a time. When we see this happen in scripture it is always for a greater redemptive purpose i.e. Pharaoh and Moses or Israel's hardening in order that the Gospel be preached to the Gentiles, etc. None of those who were judicially hardened went without many opportunities to repent, think of how many times God asked Pharaoh through Moses to let the Israelites go! A popular Calvinist Pastor Mark Driscoll called the outcome of this doctrine "duck, duck, damn," and rightly so. I believe Mr. Driscoll believed in some sort of alternative to this doctrine while remaining loyal to the other Calvinistic doctrines. I would take up the same issue with this. If God selectively chose some people to be saved and selectively did not choose others then we come to a classic problem which has been deemed "double predestination." This results in God actually predetermining many people to go to hell with no hope of salvation and no ability to repent. The Calvinistic reasoning for this perspective is that if God did not choose people "unconditionally," or in other words "not in response to seeing their faith and repentance," then it would automatically mean that God's choosing is based on the merits of ones faith and repentance, which they argue would equal a works-based salvation. I disagree, primarily because belief comes from hearing the Gospel, not from our own power. The Bible in no way states that faith is something which is meritorious, that is, it cannot earn righteousness for us by using it. However, we can use faith to receive the gift of righteousness that God offers to us in Christ. Therefore, exercising faith doesn't earn righteousness from God it simply exhibits confidence in the work of righteousness that Christ did for us through living a sinless life, dying on the cross, and rising from the dead. The Calvinistic argument is comparable to this: I give you a check for $500. All you have to do is endorse it and put it the bank to receive the benefits. So you receive it, endorse it, and put it in the bank. Then you go to all of your friends and say "I earned $500 today!" Your friends say, "how so?" And you say, "My friend Kyle gave me a check for $500 and I endorsed it and put it in the bank!" Then your friends reply, "Are you mad? Endorsing a check is not earning the money, it's simply receiving the money that someone else earned and gave to you." So it is with God. He offers us the free gift of salvation. We are responsible for receiving it by faith to reap the benefits therein. Receiving the gift does not mean we somehow earned it, it means we simply received what Christ earned for us through His righteousness alone. Although we do "choose" to receive the gift by faith, this does not contradict the fact that God ultimately chose us. When the prodigal son chose to return home he did not somehow "earn" entrance back into his Father's house. The Father's had the "final say" as to whether the son would be received back into the household or not. God's choosing is based upon His grace alone and received by a person through faith alone in Christ alone, because of this nobody can claim that they somehow earned it through works. Let me put it another way, God has predetermined (chosen) before the Creation of the world to save a body of individuals who come to Him in faith and of their own choosing (God is a gentleman, He doesn't force us to love Him). So we see that although we come into God's chosen body through meeting the condition of faith and repentance (which doesn't earn us righteousness), we are only among the chosen because Christ paid the price for this collection of believers to even exist, He bought our forgiveness for us. Without God making this option (salvation through the Gospel) possible, faith and repentance could never even happen! Therefore the Calvinistic assumption that says repentance and faith somehow earns righteousness if it doesn't come through unconditional election has no standing! Even our ability to receive faith is provided by the Holy Spirit's drawing through the Gospel(see Romans 10:17), and God's general revelation that warns us all to repent (Titus 2:11, Romans 1:18-20, Proverbs 1:20-33). This concept of being chosen by God's foreknowledge of those who would be His group of believers (Traditional Election) rather than God's mysterious selection of some humans (Calvinist Election) is known as "corporate election" which was a very common perspective among early Christians and a large majority of evangelicals today. So God gives everybody an opportunity for faith when they hear the Gospel. He also gives the entire world "general revelation" (see Romans 1:20, Proverbs 1, & Titus 2:11) in such away that they can respond to His light, or move away from His light. The Bible demonstrates that everyone is given an opportunity for faith when they hear the Gospel in Romans chapter 10. In this chapter Paul is still discussing how much He desires the Jews to come to know their Messiah. He goes on to explain how they cannot be given an opportunity to repent unless someone goes to them and preaches the Gospel (v. 14-15). In Verse 16-18 Paul says, "But not all the Israelites accepted the good news. For Isaiah says, “Lord, who has believed our message?Consequently, faith comes from hearing the message, and the message is heard through the word about Christ. But I ask: Did they not hear? Of course they did. Notice that Paul explains that all the Israelites heard the Gospel in such a way that they could have responded with faith. He says, "Did they not hear? Of course they did," immediately after saying "faith comes through hearing the message." So Paul makes it plain that Israel heard the Gospel in a way that they could have responded with faith, but instead they still chose to reject it. It goes the same for all who hear the Gospel today, God invites us to freely accept or reject it, no strings attached. Now some of the contentions that are asserted by Calvinists against their opposing views such as Corporate Election are "don't you know that John 15:16 says, 'you didn't choose Me, I chose you'"or "don't you know that John 6:44 says, 'No one can come to me unless the Father who sent me draws them' and they will possibly cite other scriptures that go along with the same general theme. OK let's take a look at these two passages. In John 15:16 Jesus is speaking to His hand picked disciples about His appointing them to go and be messengers of the Gospel. As you may recall that early on in the gospels Jesus actually chose these disciples for the future service of apostleship. In context, this verse is not referring to individual salvation, it's actually referring to Jesus choosing certain men from Israel (according to God's promise given to Abraham that "all nations will be blessed through him") to go and proclaim the Gospel to every creature under heaven, while also providing the leadership for those who would become disciples through their message. For a deeper look at God's choosing of the 12 apostles CLICK HERE. Furthermore, as I explained earlier Christians are chosen corporately in Christ according to their association with Him as the elect representative of the entire church (their faith in Him brings them into God's corporate election of the church). Ephesians 1:4 says, "He chose us in Him (Christ) before the foundation of the world, that we should be holy and blameless before Him." So we are chosen corporately IN CHRIST as individuals who are part of His body. And this is something God determined to do before the foundation of the world. This was the standard Jewish perspective on election, and we must remember that Paul was a former Pharisee. Our western culture has taken on a individualistic view of election when in reality the Jews who wrote the Bible had a corporate view of election that flowed down to individuals. For more on this CLICK HERE. In John 6:44 Jesus says, "No one can come to me unless the Father who sent me draws them." As we discussed earlier, Calvinists interpret this to mean that God regenerates certain people for belief even before they hear the Gospel. Firstly, in this passage Jesus was speaking to his chosen disciples in the midst of a situation were many other disciples were going to stop following Him. This is because Israel was becoming calloused and God was setting apart a remnant (the twelve) to proclaim the Gospel to the whole world in accordance with prophecy. The Father was drawing the 12 Jewish disciples to Jesus as His remnant to proclaim salvation to the Gentiles, while causing the Jews who had grown calloused through rebellion to walk away in droves. For a deeper look at the contextual aspect of John 6 and it's meaning CLICK HERE. The apostle Paul explains this in Romans 9:27-33. Even if this scripture is applicable to Christians in the New Covenant I would still contend that the means by which the Father enables individuals to come to Jesus is the Gospel, not a regenerative grace for select individuals given prior to hearing the Gospel. This is further illustrated by Jesus in John 12:32 where Jesus says, "And I, when I am lifted up from the earth, will draw all people to myself." The Gospel is about Jesus being lifted up on the cross to die for the sins of the world, and this Gospel is the means by which the Father enables ALL men to make a decision to believe or reject salvation. So Paul wraps up this entire discussion on election by explaining that one group (Israel) was unable to enter into God's chosen body of individuals because they pursued entry by works, but the other (Gentiles) was able to because they pursued it by faith! What Paul is saying is that if Israel would have pursued by faith and not works they would not be hardened! He also explains in chapter 11 that Israel can still be “provoked to envy and possibly saved,” that they "will not stumble beyond recovery," and "could be grafted back in if they leave their unbelief in Romans 11:23." This realization prevents a conclusion that God predestines people for hell with no possibility of salvation, rather it supports the notion that God predestines people to a choice to accept or reject. Israel could have been saved had they not grown calloused. It's important to remember that in the process of one growing calloused they are given many chances to repent, look at all the miracles Jesus did in Israel yet they still did not believe! For a robust contextual overview of Romans 9 read my article HERE. The consistent notion we find in scripture is that God desires and invites all people to be saved through the Gospel, although He may use certain instances of rebellion temporarily for redemptive purposes, and this was the case with Israel in Romans 9. 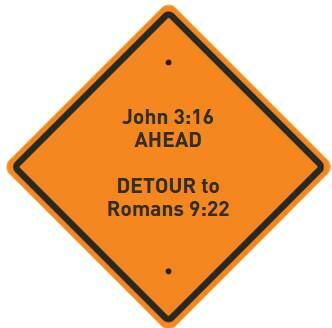 For more on the problem of Calvinistic double predestination CLICK HERE. Limited Atonement addresses the purpose of the atoning death of Christ. It maintains that God's design and intent in sending Christ to die on the cross was to pay for the sins and secure the redemption of those whom God has predetermined to save, namely the elect. Therefore, the primary benefits of his death (especially as an atonement) were designed for and accrue only to believers. 1 Timothy 2:5-6: "For there is one God and one mediator between God and men, the man Christ Jesus, who gave himself as a ransom for all men. These are just two of the many verses which refer to Jesus' death being an atonement for the entire world, not to mention the classic John 3:16. The way that Calvinists often interpret verses like this are by proposing that the word "world" means "every people group" instead of "every individual." But a quick look at the Greek definition of the word "world" shows us that this is just not the case. Exegete B. F. Westcott says: "The fundamental idea of kosmos (world) in St. John is that of the sum of created being which belongs to the sphere of human life as an ordered whole, considered apart from God....the world comes to represent humanity in its fallen state, alienated from its Maker." Therefore, my view on limited atonement is that it fails to agree with the whole of scripture. I believe that when Jesus died it was for the sins of the entire world, just as scripture tells us. Scripture also tells us that the atonement of Christ is only "applied" to those who come to Him by faith and repentance (see Romans 10:13). So although I believe Jesus did die for the sins of the entire world, people are still responsible for receiving His atonement in order to be saved, this is why God commands us to make disciples of all nations! In the same way that limited atonement is rooted in the idea of unconditional election, so is irresistible grace. This doctrine is in contrast to another popular doctrine from the Arminian theological perspective called "prevenient grace." Calvinism basically teaches that God exerts His grace to those He has chosen to be saved in such a way that that they cannot resist it, and they eventually are compelled to repent. As a result those who do not have this irresistible grace given to them by God are left in their state of inability to respond to the Gospel, they are predestined to be damned. The Arminian teaches that God instills a certain measure of grace into each person such as to give them the ability to at least accept the Gospel, so that if they reject the Gospel they are left responsible for damnation, not God. It is true that before the Bible was completed God would sometimes use outwardly persuasive methods in order to carry out His plan of bringing forth messengers from Israel. Jonah, Paul's conversion, and Jesus showing the scars to doubting Thomas are examples. But this does not mean that this is God's primary way of going about business, and it certainly does not equate to God using internally irresistible means to convert a limited number of believers. The point of God using outwardly persuasive means with certain Israelites was to get things to the point where the Messiah would be proclaimed to the world giving everyone the chance to repent. Jesus said "blessed are those who believe without seeing (John 20:29)," as a reference to the future proclamation of the Gospel to all nations. Here we see Jesus clarifying that outward persuasion is not the primary method ordained of God to get responses from people, but rather the Holy Spirits drawing through the proclamation of the Gospel. Being that I have already touched on the process of man responding to the Gospel apart from a pre-regenerative work of grace I will point you back to the first section on "Total Depravity" if you need a refresher. My point is, irresistible grace is not taught in the Bible. We cannot take a few instances in which God used outwardly persuasive means to get certain Israelites to obey Him and equate that to an entire doctrine regarding how men are saved. Rather we must stand firmly on the clear revelation of scripture given us in Romans 10:17 which says, "faith comes from hearing, and hearing through the word of Christ." Lastly, it is important to point out the logical consequence we face if irresistible grace is true. That is, if God is going to irresistibly save all those whom He has "individually chosen" (as opposed to corporate election) from the foundation of the world, what is the point of preaching the Gospel? If you do not feel irresistibly compelled to preach then you really have no reason to, or at least you have less of a logical reason to. But in the correct perspective of God desiring all men to repent and the Gospel being the method by which He enables them to make a decision, we have all the reason to go into all the Earth and make disciples by proclaiming it! Perseverance of the Saints is the Calvinist doctrine that those who are truly saved will persevere to the end and cannot lose their salvation. It doesn't mean that a person who is truly saved will never lose faith or backslide at any time. But that they will ultimately persevere in faith (inspite of failures) such as not to lose their salvation. Can you lose your salvation? I want to begin by admitting that I conceptually agree with the Perseverance of the Saints. The area of disagreement that I find is not in the fact that all true believers have eternal security but rather that this reality is rooted in unconditional election. The fact of the matter is that Perseverance of the Saints is rooted in God's promise to seal us when we believe, not necessarily in the idea that God chose some to be saved and some to be damned before the world began. When one meets the condition of responding to the Gospel with faith and repentance they become included in Christ and sealed with the Holy Spirit until the day of redemption. The Calvinist will assert that because God individually, unconditionally chose each person who would be saved before the Creation of the World then they cannot possibly lose their election based upon that assumption. So the Calvinists and I come to the same conclusion, yet we use different means to get there. So above we find Paul explaining to the Ephesians that we are included in Christ when? Individually, unconditionally before the foundation of the world? No, it says "when you heard the message of truth,the gospel of your salvation." So when we hear the Gospel of Christ and you allow it to pierce deep into our heart, it produces faith (see Romans 10:17) which redeems us and includes us among the eternal predestined holy people of God. He goes on to explain whether or not we can be "excluded" from Christ at any point saying, "when you believed, you were marked in him with a seal,the promised Holy Spirit, who is a deposit guaranteeing our inheritance until the redemption of those who are God’s possession." So Paul clarifies that once we are included in Christ we are sealed from ever being excluded from Christ, notice we are sealed "until the redemption of those who are God’s possession." This is another classic scripture touted as evidence that a true believer can lose their salvation. What some scholars have failed to take into account is the fact that the author was speaking to Hebrew Christians that were undergoing great persecution for leaving Judaism. Among these Hebrews were those who may have been exposed to the Gospel in such a way that they were receptive, but not yet accepting it fully with their hearts. These men would fit into the category of the individuals mentioned in the parable of the sower where the seed was "sown on rocky ground: the ones who, when they hear the word, immediately receive it with joy. And they have no root in themselves, but endure for a while; then, when tribulation or persecution arises on account of the word, immediately they fall away (Mark 4:17). It is estimated that this letter was written after the temple was destroyed in Jerusalem in 70 AD and because of this no more temple sacrifices were being made. Therefore the author is calling these men to not fall prey to falling away from their desire to convert in the face of persecution, because there "remains no more sacrifice concerning sins.” The author was emphasizing that Judaism offers no provision for atoning for sin because the temple has been destroyed, and God allowed this to happen because Christ became the perfect sacrifice that takes away sin for all time (Hebrews 9:28). Therefore we can see how this verse perfectly fits the context of the author appealing to men who had received a "full knowledge of the truth" but were considering turning back to Judaism instead of trekking forward into a full embrace of the Gospel by faith in Jesus Christ. As you can see there are many Biblical disagreements to be had with Calvinism along with some minor agreements. Does this mean that Calvinists are not Christian? Absolutely not. I know many people who truly love the Lord with all of their heart yet they subscribe to the Calvinist systematic of TULIP. TULIP is one of the interpretation models that is used by many respected scholars to explain some very tough topics in scripture, and when people are given this interpretation method early on in their Christian journey it is hard for them to depart from it later on. This is why I believe that we should obey the Bible in when it says to "test everything; hold fast what is good" (1 Thessalonians 5:2). I hope this overview of Calvinism with Biblical responses to each point will help people as they investigate the wonders of God's Word in order to "rightly divide the word of truth" (2 Timothy 2:15). God Bless! Labels: Arminianism, Bible Basics, Calvinism, Eternal Security, Exegesis, Free will, Is Calvinism Biblical?, The Gospel, TULIP, Unconditional Election, Unlimited Atonement, What is Calvinism? I am speaking the truth in Christ—I am not lying; my conscience bears me witness in the Holy Spirit— 2 that I have great sorrow and unceasing anguish in my heart. 3 For I could wish that I myself were accursed and cut off from Christ for the sake of my brothers, my kinsmen according to the flesh. 4 They are Israelites, and to them belong the adoption, the glory, the covenants, the giving of the law, the worship, and the promises. 5 To them belong the patriarchs, and from their race, according to the flesh, is the Christ, who is God over all, blessed forever. Amen (Romans 9:1-5). "A person is not a Jew who is one only outwardly, nor is circumcision merely outward and physical. No, a person is a Jew who is one inwardly; and circumcision is circumcision of the heart, by the Spirit, not by the written code. Such a person’s praise is not from other people, but from God." This theme of God fulfilling His covenant to Abraham through an Eternal Israel that includes both Jews and Gentiles (Ephesians 2:15) is what sets the stage for the rest of this chapter in which Paul answers objections from Jews who are under the assumption that God was never planning to do such a thing, they believed that the promises were only for "historic Israel" for all time. In reality the promises were originally for historic Israel but God told Abraham that this would not be the final outcome saying "and through your offspring all nations on earth will be blessed (Genesis 22:18)." Here Paul begins by qualifying that Isaac was the "child of promise" by quoting the direct promise from the Old Testament in verse 9. He draws a direct connection between believers (Eternal Israel) and Isaac as the "children of promise." He then goes on to draw a direct connection between God's promise to Sarah and God's promise to Rebekah concerning Jacob and Esau. Why does he do this? Because there is a direct connection between what Paul is explaining about Jews and Gentiles and how God dealt with Rebekah's children Jacob and Esau in the Old Testament. Notice the very particular language Paul uses here, “not because of works but because of him who calls— 12 she was told, “The older will serve the younger.” 13 As it is written, “Jacob I loved, but Esau I hated.” Later on in this chapter Paul explains the reason why God rejected Israel and accepted the Gentiles saying, “What shall we say, then? That Gentiles who did not pursue righteousness have attained it, that is, a righteousness that is by faith; 31 but that Israel who pursued a law that would lead to righteousness did not succeed in reaching that law. 32 Why? Because they did not pursue it by faith, but as if it were based on works." So who do Jacob and Esau represent in this passage of scripture? Jacob represents the Gentiles (including the remnant of Jewish believers) and Esau represents historic Israel (those who "sold their birthright" by rejecting the Messiah, see Genesis 25:29-34). So Paul is using God's choosing to bless Jacob to illustrate God's choosing to include the Gentiles into his group of holy people. But did God do this unconditionally without a known reason as Calvinists would assert? Not at all, as we just read He chose to include the Gentiles because they pursued Him by faith (which means it was conditional election), and He chose to harden Israel because the pursued Him by works (another conditional choice), thus the phrase "not because of works but because of Him who calls." Now that we have clarified that the context is that of Israel being cut off and the Gentiles being grafted into God's family we can easily see that the objector in verse 14 is a Jew objecting to God offering the promise of redemption to every nation, and hardening the nation of Israel (except for a remnant) because of their rejection. The Jew is basically saying "God is unjust because He has cut us off and drawn near to the pagans!" The Jews of that day felt a sense of entitlement to God's promises, even though they disqualified themselves by pursuing them by works and not by faith. And Paul responds by saying who are you to question God's wisdom in the matter? He quotes, "I will have mercy on whom I have mercy, and I will have compassion on whom I have compassion." Here we find Paul building upon this idea of God using the willful rejection and subsequent hardening of a person/people for His ultimate redemptive purposes. We must keep in mind that Paul never leaves the context of this dilemma between historic and eternal Israel. The clay represents historic Israel in the situation at hand in which the they had rejected the Gospel and God choosing to allow the Gentiles to be grafted into the promises He gave to them. This situation is unique in that His people Israel had rejected the very Messiah they had been waiting for many years and thus incurred upon themselves a spiritual hardening to the things of God. The molding of the molder is God working out the situation into redemptive purposes. Instead of destroying Israel for their willful rejection of Him, God decides to "endure with much patience the vessels of wrath prepared for destruction." Israel had come to the point in which God could show them all of the signs and wonders in the world (as He did through Jesus) and yet they still would not repent, therefore as a consequence they were handed over to God's wrath. The word "prepared" found in the phrase "prepared for destruction" is the Greek word "katērtismena" which means to be "fitted or adjusted." This term has no implications that point to God predestining them to hell, but rather that through their own willful rebellion they had postured themselves to be deserving of punishment. But why did God endure patience with them, why didn't He destroy them since they has postured themselves to be deserving of punishment? Firstly it would accomplish the crucifixion of Christ, secondly it would cause the Gospel to go to the whole world creating one new man (the body of Christ) containing both Jew and Gentile (Ephesians 2:15)! God did not want to destroy Israel because he knew that through saving the Gentiles it would provoke them to envy that they may be saved (Romans 11:11). Thus Paul says, "endured with much patience vessels of wrath prepared for destruction (obstinate Israel), 23 in order to make known the riches of his glory for vessels of mercy (the Gentiles & Eternal Israel), which he has prepared beforehand for glory— 24 even us whom he has called, not from the Jews only but also from the Gentiles.” What are the riches of His mercy that God wants to make known? The Gospel! Who are the vessels of mercy? Those who would accept the Gospel among Jews AND Gentiles! Therefore this section of chapter 9 has nothing to do with God predestining some for hell with no opportunity for salvation and some for heaven by irresistible grace as Calvinists often assert. Rather it is addressing the willful rejection of the Messiah by Israel, and God's redeeming of the situation (the clay) through showing them patience anyways (not destroying Israel for their rebellion) in order that the Gospel be preached in the whole world (the vessels of mercy)! In the first part of this final section Paul quotes Isaiah regarding the remnant of Israel that will respond to the Messiah despite the general culture of stubbornness. Then he quotes a verse that is quite peculiar if you don't take time to put the pieces together, he says, "If the Lord of hosts had not left us offspring, we would have been like Sodom and become like Gomorrah.” Who are the "offspring" mentioned in this passage? If you go back to verse 7 you will find that the offspring are the "children of the promise, or Eternal Israel" So basically Isaiah is saying that had this instance of Gentile inclusion not happened (forming Eternal Israel) Israel would've been destroyed, as I mentioned earlier. But because God continued His work though the church (in order to provoke the Jews to envy, that they may be saved), God's promise to save Israel will by no means be thwarted (we see in Romans chapter 11 that historic Israel can/will STILL be saved). "O Jerusalem, Jerusalem, the city that kills the prophets and stones God's messengers! How often I have wanted to gather your children together as a hen protects her chicks beneath her wings, but you wouldn't let me." Notice why Jesus didn't save Israel, because "they wouldn't let Him (they did not pursue Him by faith)" not because He predestined for them to go to hell. God wants a people who freely chooses to love Him, therefore He will not save people who stubbornly refuse Him. So there you have it. A proper exegete of Romans chapter 9 which has clearly shown some major misinterpretations made by Calvinists. I hope and pray that this article will help those who are seeking God's truth to see the beauty of what Paul was truly writing in Romans 9. God bless!